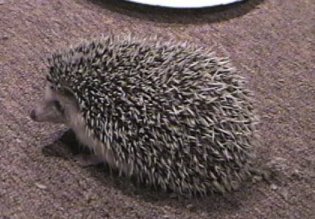 Sonic (left) and Prickles (right) on 10/25/02. Male or Female and How Many? Note: I am not a hedgehog expert. So, please read what I have written and then do not believe it unless you also read it on the other web pages and in books, etc. Most of the information on this page came from books and web sites, and like me, they are sometimes wrong. My goal here is to try to conglomerate the information from many web sites, books, and personal experience to try to include the things that I really would have wanted to know ASAP and to include as many little secrets to keeping happy and healthy hedgehogs as possible in one location. I was VERY surprised by the tons of information out there on hedgehogs. You just have to know where to find it. If you are new to hedgehogs, I hope this page will overwhelm you with good information. If you are not new, I hope you will learn a few new secrets (new food to try, new site to visit, new tidbit of information) to bring more pleasure to your little spiny ones! Note: Both of my poor hedgehogs have died. Return to the main hedgehog page. 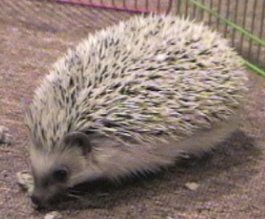 See the master index for the hedgehog pages.